Let me begin by saying that the converted warehouse by the water is a lovely location, and at first glance a beautiful, inviting store. Your merchandising scheme, however, appears to have been hatched by a bunch of fun house planners in collaboration with inmates of a state mental hospital who have been off their meds for some little time. For example, there are spices in at least four locations, and I can only assume there may be more. By the time I get to display number three on any given trip I’ve forgotten whether I need cumin or coriander, not to mention where I am and the correct spelling of my own name. Why not put it next to the Quaker oats? Not convinced? Let’s consider the oatmeal: On my last trip I discovered several varieties in the organic annex, right after I discovered the organic annex. I haven’t kept count or anything, but I would guesstimate that I had visited your store approximately 100 times before the day in question and it was only on visit number 101 that I realized you segregate the organics in their own gated community. Speaking of which, isn’t your little grocery apartheid just a bit antiquated? Organics in their own cozy, separate enclave, carefully screened and at a safe distance from the regular grocery item ghetto? Who really benefits when the Old Wessex porridge is kept at a remove from the Quaker oats? Is Fairway truly safer or better for it? I think you know the answer to these questions. Look deep within yourselves for the truth, gentlemen. Since we’re having this little chat, I’ve got a bone to pick with your inventory priorities. Who exactly made the executive decision to have upwards of 500 brands of yogurt, but only one type of kitchen sponge and no rye flour? Or is the rye flour in the organic section? Perhaps it’s kept in some special room that only executive key holders can access. Who knows? I can tell you one thing: it is NOT in amongst the baking supplies, say next to the whole wheat flour or just above the granulated sugar. On the subject of sugar, I’d just like to say that putting the ruinously expensive gram-measure-only packets of muscovado and demerara well ahead of the affordable Domino versions does not trick me into buying the big ticket items. And yes, I am the shopper who routinely leaves the imports orphaned among the hoi polloi. If you think I’m going to walk all the way back to return the bag of whatever I grabbed in desperation from the gourmet rack in aisle 3-a after I’ve finally found its domestic equivalent in aisle 57-b-1, you’ve got another think coming. And if you’re hoping I’ll opt to just pay more to avoid said extra miles, you have lost your mind. I’m entirely willing to leave the princess to her fate among the rabble, pal. Besides I couldn’t possibly find my way back through that rat maze of dead ends and blind turns to replace said item even if I wanted to. Note to Fairway site planners: If you have to provide a map of the store on every shopping cart, you’ve got a layout problem. This, I believe, was a crucial contributor to my somewhat frazzled state at the time of the incident. You see, I was physically and psychically exhausted by the time I made my way to the check out line. Two hours previous I’d been looking for Brillo pads, but must have taken a wrong turn at imported gluten-free crackers because somehow I ended up in the Lambic specialty section of the Belgian beers. At least that’s what the investigating officer surmised. Anyway, this is probably a good time to clarify that those bottles of Hefeweizen must have already been open when I put them in my cart – I suspect the stock boys might have had a nip between shifts, and who could really blame them? So getting back to the little incident. In closing I would like to say that I had not had too much to drink when my altercation conversation with your minion manager got a little fraught; rather, I’d say I hadn’t had enough. By the time the tow truck and EMS arrived, the sun had long since set and everyone, I think, was steadied by their little nips from my hip flask. Want to read more about the agony and the ecstasy of grocery shopping in New York City? Check out Patricia Marx’s article, A Bushel and a Peck, in the January 16 edition of The New Yorker. You’ll need to subscribe, but you should at least be pretending to read the magazine anyway. Posted on February 10, 2012, in Drudgery, Words to live by and tagged Cocktails, Drink and Food, Fairway, Fairway Market, Humor/Commentary, Life, Local, Opinion, Pathmark, Police blotter, Quaker Oats Company, Red Hook Brooklyn, Sherpa, Shopping cart, Sugar. Bookmark the permalink. 33 Comments. Hey, I thought I had made a brilliant comment on this post, but can’t find it in this thread now. Know I was here, because I had LIKED the post. There must be a black hole at WordPress that’s somehow paralleling the one in my life, and the one that you encounter when you grocery shop. How will you adjust to the grocery stores of SF? Personally, I shop for the people and not so much the selection, which is why the Winco foods here in potato land is full of variety. The other day saw a lady with a fake cabbage patch like baby sitting in the cart, complete with a seatbelt. I tried to get a picture of the baby but the lady’s fake flowers and bees in her bonnet were covering the thing. The search continues…. Grocery stores? There are grocery stores here? So far all I’ve found is restaurants. So no need to shop. For food anyway. You are the high priestess. 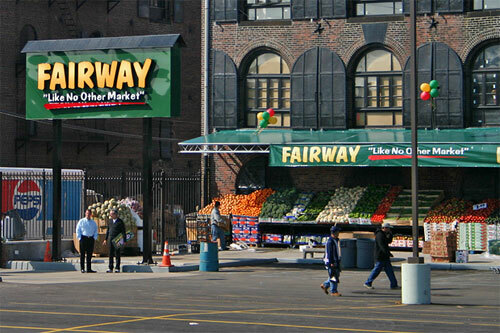 If I can come to NY this summer, can we go to Fairway in disguise? I’ve pulled up stakes and moved to San Francisco, Peach. And it was NOT because I was under threat of arrest from Fairway. A lifetime ban is not necessarily followed by incarceration, btw. Oh, man. I am devastated. Come west. I have not seen a raindrop or a temp below 68 since I got here 10 days ago. California is SO working for me! Clearly I need to buy more lottery tickets in order to finance my future travels. Hi Wendi, the article hit home. Spent yesterday in Stop & Shop just a Xanax and muscle relaxant short of DUI. It helps. The muscle relaxant is prescribed and the Xanax was a proactive approach to an impending crash. You’ve made my weekend. P.S. I’m watching Martha brainwash her minions on PBS. Reblogged this on Kitchen Slattern. Thank you. If my trials at the hands of Big Grocery can bring a smile, even a smirk, to one face, my suffering, though legendary even in hell, has not been in vain. You, Jed, are one sweet talker. You have a knack for titles! Thank you! Actually I just have way too much time on my hands. Hey Kitchen Slattern, the Fairway (The bourgeois Culinary Oppressors) had it coming and I’m proud you gave it to them. Thank you for saying so, Mel. Having to shop at Pathmark is a high price to pay. Of course, there’s always Fresh Direct. At least with them you can shop in your underwear without causing a scene. Thanks for stopping in! Your photos’s strangely familiar…. How weird. I went to the store for Belgian beer and walked out with Brillo pads. Ok, that’s a lie. Funny stuff! Love visiting you. How weird that you know how much I love to be lied to. FUNNY post! Was able to read it while ripping apart my chicken for your recipe (manly-style)…the power tools didn’t work. Happy week end. Glad you were able to have a medieval moment. Nothing like having your hands drip with chicken grease to loose the inner Tudor I always say. Well, I don’t ALWAYS say it, but I just said it now, which is almost the same. Thanks for reading Peter! The store I go to keeps olives by the barbecue supplies. I feel like yelling and ranting every time I go to get olives. In the psych ward, the olive-BBQ pairing is considered symbiotic. I have HEARD. I had a similar issue at the grocery store involving beer. Well, not really similar at all, but there is the beer commonality and also a parking lot. So that’s two. Anyway, when I was a sophomore in high school, I rolled my navy blue Honda prelude up to a Budweiser beer truck, sitting idle in the parking lot, and stole two cases of Busch Light. And nobody ever caught me. Not even my mom when I stored them, warm, in the top of my closet until my besties and I could siphon them off, one-by-one. Which is why I’m happy she doesn’t read your blog. I am officially adding you to my blogroll. Now go by a lottery ticket because this is seriously your lucky day. Clever girl! You did not get caught and waited for the statute of limitations (if in fact there is one on theft) to run out before coming clean. I won’t tell your mom, though I would tend the doubt she’s completely unaware of your larcenous behavior. Thank you SO much for adding me to your blogroll! The company is suitably snarky, and I am sure I’ll feel entirely at home. Love your work, fellow twin! It’s ALWAYS satire week. Unless of course it’s Irony Week. Absolutely hysterical. It must be satire week! Truly it’s a wonder more people don’t drink and shop. Perhaps popping some psych meds would help. I don’t know. Thank you for coming by. I love what you’re doing over at the Goat!